Born at Wakaw, Saskatchewan on 30 October 1911, daughter of Ukrainian immigrant farmers Mykyta Zakus and Anna Wytrykush, she attended the University of Manitoba Law School and was the first female lawyer of Ukrainian descent in Canada. She married in 1940, and practiced law from an office at home. Widowed in 1960, she was left to raise three children on her own. A Progressive Conservative candidate in the 1959 and 1962 provincial general elections, she was made a Queen’s Counsel in 1965 and, three years later, she was appointed Judge of the Winnipeg Juvenile and Family Court. 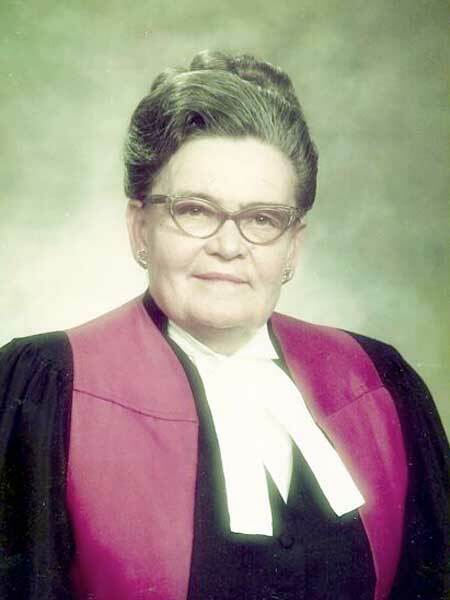 In 1975, she was named Judge responsible for the Provincial Judges’ Court of Winnipeg (North). Believing that “community service is the rent we pay for the privilege of living upon this earth,” she served on the boards of numerous organizations. She was on the Advisory Board of the Holy Family Home, a member of the Dominion Executive of the Ukrainian Canadian Women’s Council, Business and Professional Women’s Club of Winnipeg, Board of the Canadian Council of Christians and Jews, Ukrainian Catholic Women’s League, Children’s Aid Society of Winnipeg, and a board member of the United Way, City of Winnipeg Housing Corporation, Manitoba Centennial Corporation, and Manitoba Association for Equality in Education. She was Vice-Chairman of the Driver’s Licensing Appeal Board. In 1955 she was named “Woman of the Year” by the Winnipeg Tribune. She received the Community Service Award of the City of Winnipeg (1965), Centennial Medal from the Secretary of State (1967), Shevchenko Medal from the Ukrainian Canadian Committee (1971), and Human Relations Award from the Canadian Council of Christians and Jews (1976). She died at Winnipeg on 15 April 1977 and was buried in All Saints Cemetery. A collection of her papers are in the “Archives of the Ukrainian Canadian Experience” at the University of Manitoba Archives & Special Collections. Obituary, Winnipeg Free Press, 18 April 1977. We thank Marianne Wawrykow for providing additional information used here.